The original Age of Apocalypse storyline in the mid-90s was one of the most epic comic book storylines I have ever read. Apocalypse ruled an Xavier-less world with an iron fist. The strongest mutants lived in plenty while humans and "lowers" mutants lived in squalor and often worked as slaves or were "culled" to be experimented on and tortured by Apocalypse's loyal subjects Sinister and Dark Beast. Half of the U.S. had been obliterated by nuclear warheads seized by Apocalypse. And the X-Men were a rag-tag group of rebels under the command of Magneto fighting to free both mutants and humans from Apocalypse's tyrannical rule. An epic battle between Magneto and Apocalypse as well as Nate Grey and Holocaust capped off a helluva alternate universe tale. Fast-forward 10 years later and Marvel cashes in on this noteworthy tale with nothing more than a pile of garbage. 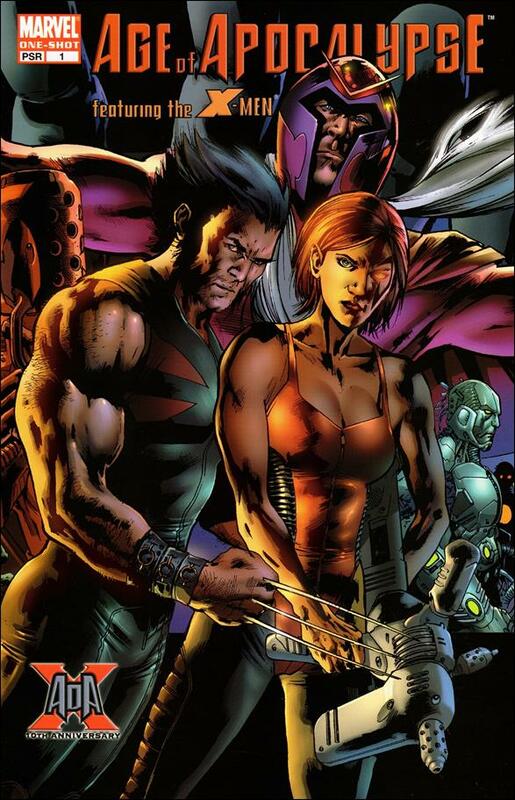 The story was quite bland and run-of-the-mill: At the end of X-Men: Omega, instead of their world ending for the main-Marvel universe to return, their world goes on and the nuclear bombs continue their assault towards Armageddon. As her "dying" act, Jean Grey halts the bombs' descent in a fiery display of telekinetic power. The world, however, believes it to be Magneto who saved them. And Magneto allows them to believe this because he think he can be the leader and inspiration they need for hope. The world continues on, and suddenly an entirely too post-apocalyptic world is in better shape than the main-Marvel universe. And instead of it feeling like the Age of Apocalypse, it feels like just another X-Men story. Humans are suspicious of mutants again, and there's political arguments about human & mutant relations and rights. The main part of the story is that the only other person that knows that Jean Grey actually saved them is Sinister. He blackmails Magneto into leaving him alone if Sinister keeps the secret. Then a few years later the X-Men attack Sinister and the truth is revealed (and it really wasn't any more in-depth than that). It's then revealed that Jean Grey is actually alive and Sinister had been keeping her held captive for experiments. Sinister is defeated. Magneto is forgiven because of his "good intentions", and the X-Men continue in this Age of Apocalypse world that has now lost all of it's initial appeal. The artwork was especially atrocious, though. Man I hate Bachalo. His artwork looks so cartoony, and all of his characters look like they have down-syndrome. The One-Shot issue that directly precedes the 6-issue mini-series was actually good, though. It featured 3 short stories set in the Age of Apocalypse universe (when it was still post-apocalyptic) that were pretty enjoyable reads and gave you a little more insight into the history of this alternate-universe. And the artwork was much better. A tad-bit manga inspired, but much easier on the eyes than Bachalo's artwork; definitely less sloppy looking. If you're a fan of the original Age of Apocalypse storyline, then I'd suggest picking up the one-shot. Definitely worth it for the cheap price it goes for and will please an AoA fan. But stay far away from the crappy 6-issue mini-series. I was pretty disappointed in that mini too. I LOVED the first event in the 90's and this follow up sadly missed the mark of just being plain.